The house we call On Hemingway’s Rounds is on Whitehead Street, in a short straight-shot path from writer Ernest Hemingway’s Key West home to the old Sloppy Joe’s Bar on Greene Street. From 1928 – 1938, Hemingway lived in the house with his 2nd wife Pauline, and maintained a predictable daily routine at 907 Whitehead Street. Starting at dawn, he awoke to diligently write at his old wooden desk that still sits in his now museum home. But it wasn’t all discipline for dear Papa. Everyday like clock-work, he left his house at 3:30 pm to stroll to the bar on Greene Street, meeting up with friends for a daily dose of bar-room commiserating, and gaining inspiration for penning his next masterpiece. Now in those days, Whitehead Street was not all built-out, green spots and vacant lots dotted along the road. It’s fun to surmise that since this house, On Hemingway’s Rounds, is on a straight-shot path between Hemingway’s Key West home and the old Sloppy Joe’s Bar, it was probably still a vacant lot, a naturalist’s ‘pit-stop’ en-route. All kidding aside, in 1938, Papa was making his move away from this scene to Havana, Cuba, nursing a slow painful split from wife Pauline with whom he had made his home in Key West. During that same year, the City of Key West records show that the house, we endearingly call On Hemingway’s Rounds, was originally built. This old house is an inspired renovation of a classic 1930’s ‘American Bungalow’ redone Key West style. With no holds barred, the designer / builder envisioned a new modern home and began by completely gutting the interior to start fresh from top to bottom. While the street side remains true to the original casual arts-and-crafts form, the interior now boasts an elegant simplicity that meets even the most discerning of modern tastes. The end result is a new design that includes top-of-the-line luxury inside and a serene private outdoor tropical living room in the back yard. We begin our tour looking back from Whitehead Street where we find the house situated in a perfect little urban row of charming 1930’s island bungalows. The picturesque curb appeal is both welcoming and somehow reassuring that life is good. A little white picket fence at the sidewalk makes the entrance to the tropical flower garden, whilst the spacious front porch with antique bricked floor and anchoring concrete columns with capital posts, exudes genuine charm. 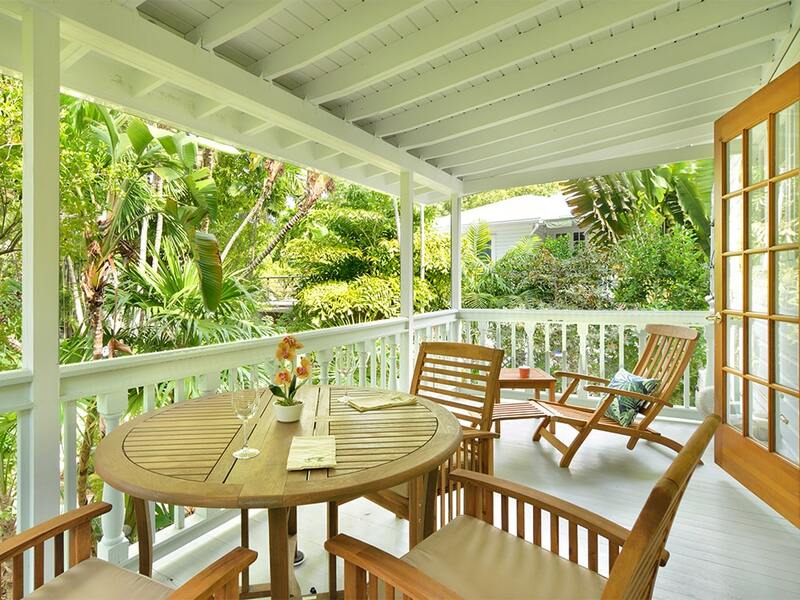 Here you find a line-up of beautiful wicker chairs set beneath porch ceiling fans, the perfect place to watch the world of Key West go by. The porch sits just enough back off the street that you can sit and observe this main street in the downtown Old Town Key West neighborhood in privacy. Lush tropical landscaping wraps from the front yard around both sides of the house framing it like a picture. Moving to the back yard, we find yet another luxury outdoor setting, a private little tropical paradise centering on a serene Zen-courtyard pool garden. Paved with antique brick, the back yard scene is made complete with dipping pool, soothing waterfall, private lounging deck, and lush tropical landscaping. 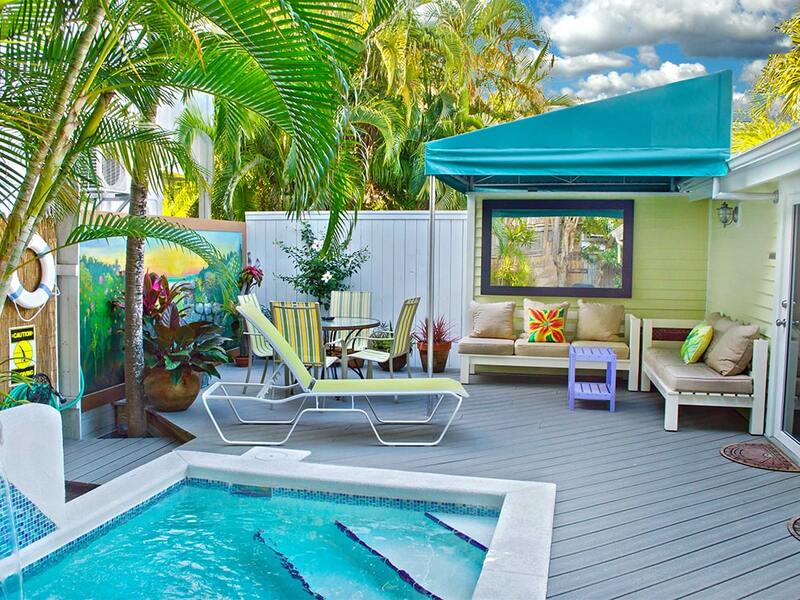 Tanning bed lounges, and a breakfast table with sun umbrella create an enviable outdoor lounge. Grab the paper or a copy of ‘Old Man in the Sea,’ and some coffee and you just might end up staying here the entire morning. Re-designed for sophisticated tastes, artistic craftsmanship is recognizable throughout this home. Everything sparkles from the luxurious kitchen with granite counter tops and top-of-the-line appliances to the gorgeous hand-hewed wooden floors and open ceiling beams in the main living areas. Furnishings throughout the home incorporate chestnut and dark tropical woods, blended with chocolate colored wicker and natural sea-grass. An earth tone tropical color palate of light brown, yellow gold, sage green, light coral, and slate grey create a natural and sophisticated ambience throughout the interior. The front of the house features the grand open great-room / kitchen area. An open concept floor plan and extra high tongue and groove ceilings are taken clear to the roof line to create a very open and spacious feel. The great-room is set as a living/lounging/entertainment center complete with large wall mounted flat screen TV. On one side of the room, custom architectural cabinets are paired with granite topped counters that wrap around to make a “U” shape kitchen. A long eating bar with double level counter makes it ideal for the host or hostess to entertain. For a sit-down dinner, there is a round dining table with a sea-grass base and glass table top set with six matching dining chairs. A wrought iron chandelier above the table completes the picture. On the opposite side of the great-room is the lounging area. A handsome décor features a tall chestnut wood entertainment center with large flat screen TV and built in sound system. Two comfortable sofas with soft-tone upholstery are set in an ‘L’ shape with a tropical wood and an oversized wicker coffee table in the center. If you want to chill out and watch a movie, put together a puzzle with 1000 pieces, or play some gin rummy, this would be the perfect place to do that. A hallway intersecting with the great room leads to the bedrooms and bathrooms. There are two guest bedrooms on either side of the hallway. In the renovation of both guest bedrooms, the builder took the ceilings clear up to the roof line as he did with the front of the house. The 1st bedroom, shown in our slide show with a white cottage style head board and two matching end tables, provides a queen size bed. A Cuba travel poster above the bed reminds us all that it’s only 90 miles away from Key West. The 2nd bedroom two offers two twin size beds with tropical wood and wicker headboards topped with pineapple finials. The luxury bathroom for the two guest rooms is also off the hallway. The designer / builder carried the granite to the bathroom vanity, and chose travertine marble for the floor-to-ceiling double wide shower. A frameless glass shower wall and door shows off the trim detail done in small earth tone glass tiles. Continuing down the hallway, to the back of the house, we find the spacious master bedroom with en-suite bathroom. Since the ceiling in this room does not have the same cathedral ceilings as the front of the house, the builder opened the master suite by removing a quarter of the wall near the ceiling. A white trim accent on top of the wall provides visual interest and recessed ceiling lights to add the feeling of spaciousness. For furnishings, a queen size sleigh bed takes a tropical interpretation with dark wood and wicker. A floor-to-ceiling entertainment center, with large flat-screen TV is nicely set along one wall for easy viewing from bed. But the premium feature of the master suite is its seamless flow to the back yard pool garden through sliding glass doors spanning the width of the back wall. This visually brings the outdoors inside and keeps the view of the pool and waterfall at eye level even when you’re relaxing in bed. The en-suite bath offers a large vanity with granite counter and upscale oversized frameless glass shower. Designer bathroom and light fixtures appoint the bathroom with an added surprise feature of a flat screen TV within view of commode! Now that’s a way to stay up with the news in the morning! Laundry: The laundry center is conveniently housed off the hallway, between the master bedroom and the other two bedrooms, neatly hidden behind a door. Notes: This property is offered as a month long or seasonal rental for persons who want to settle into the neighborhood for a month or more. 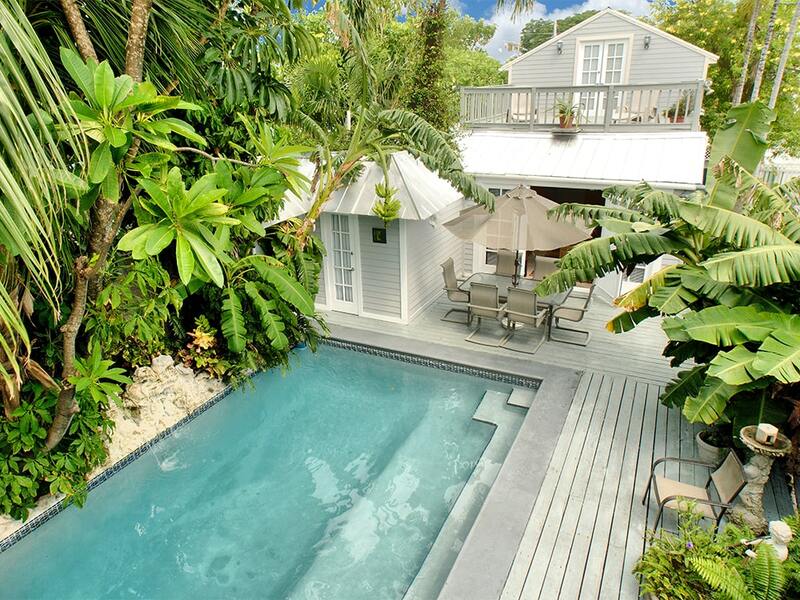 This of this property are set for professionals and executives who have discerning tastes looking for a luxurious accommodation downtown Key West that provides luxury home amenities. Amenities: Private Zen-pool garden with dip swimming pool and trickling luxury furnishings, waterfall in back yard, privacy fences, and front sitting porch with luxury outdoor chairs. Fully equipped gourmet kitchen, central a/c, flat screen TV’s, stereo, washer / dryer. Linens and towels are provided. Catering can be arranged. Maid service can be scheduled. 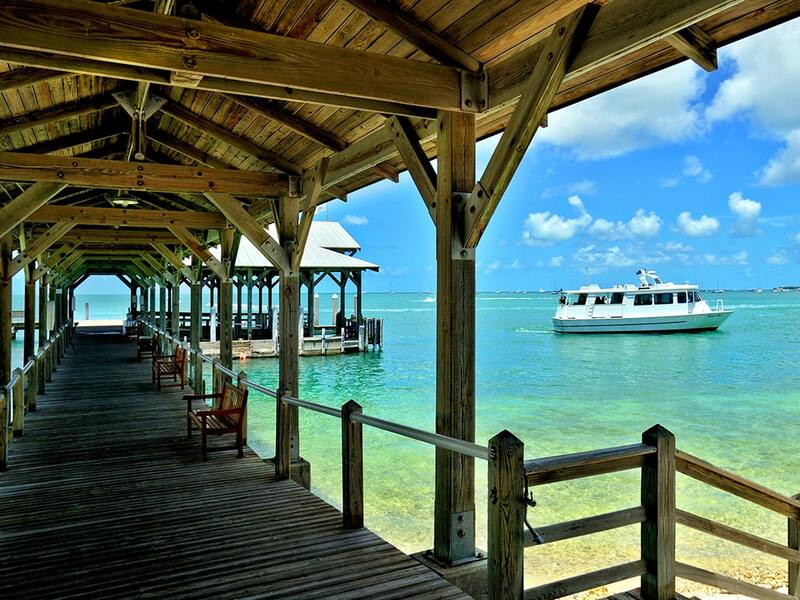 Activities: There are an amazing number of things to see and do in this little Key West urban neighborhood. 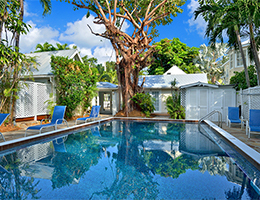 Less than a block away are the Ernest Hemingway House and Museum, Key West Lighthouse, and a plethora of famous Duval Street bars and restaurants. 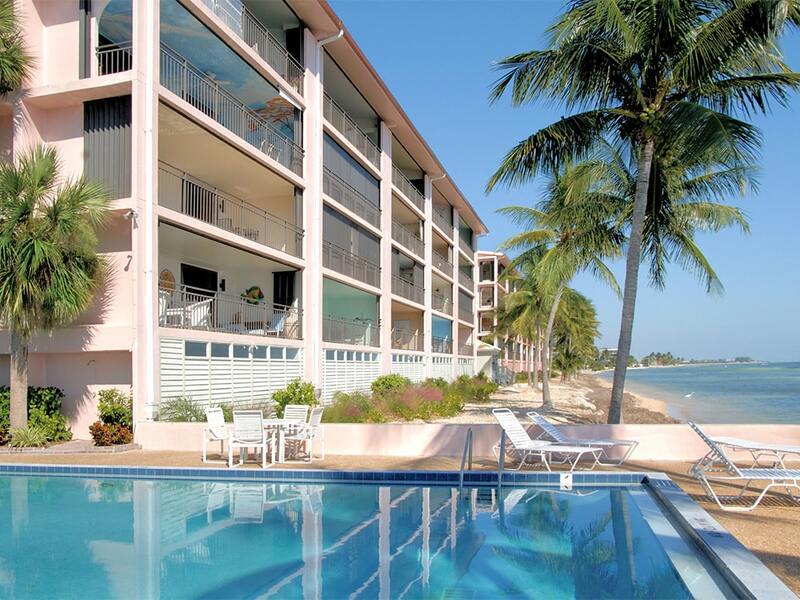 It’s close to the Southernmost Point of the United States, Mallory Square Sunset Celebration, Bahama Village, and beaches are a short walk away. Easy walk to the Historic Seaport for sailing, boating, diving, and more restaurants, bars and night life. Area: Whitehead Street is the island urban heart of Key West, where we find many famous Key West museums and landmarks are located, including the Ernest Hemingway Home Museum, the Key West Light House, the historic Key West Courthouse, and the ‘End of the Road’ photo opt at Mile Marker Zero at U.S. Highway 1. 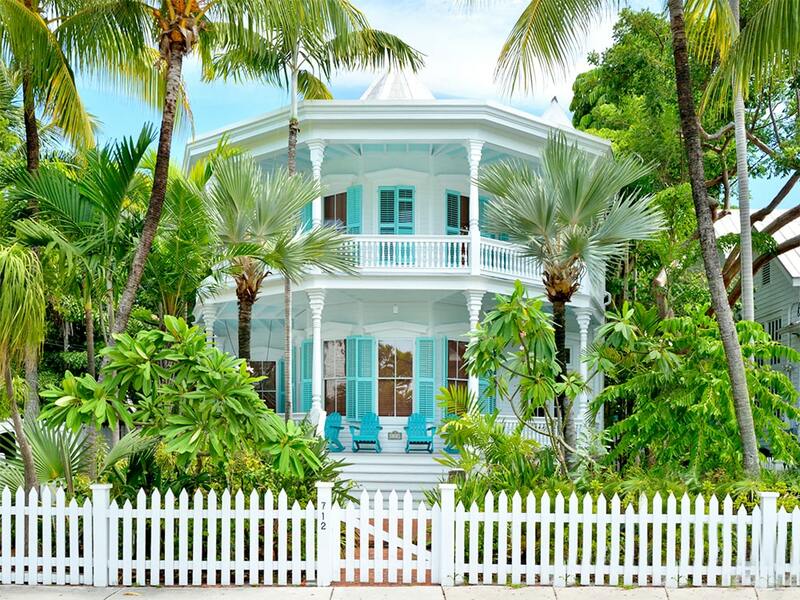 This tiny section of Key West has many blocks of beautiful historic houses and bungalows. The original Key West City infrastructure was built in the 1800’s to create a diverse array of homes, shopping, entertainment, offices, restaurants, and churches. The 800 block of Duval Street is right around the corner. Parking: Parking for this property is on the street. You can walk everywhere and do not need a car from this location. Take advantage of the pedestrian life-style in Key West, and walk or ride a bike. Remember, this part of the island was developed before there were cars! I have been vacationing to Key West for over 10 years. Dealing with Ginette and Page is always a pleasure. They know what I am looking for in reference to accomodattions, and have never steered me wrong. Thank you for everything. I will definitely call you again for my vacation plans next year! 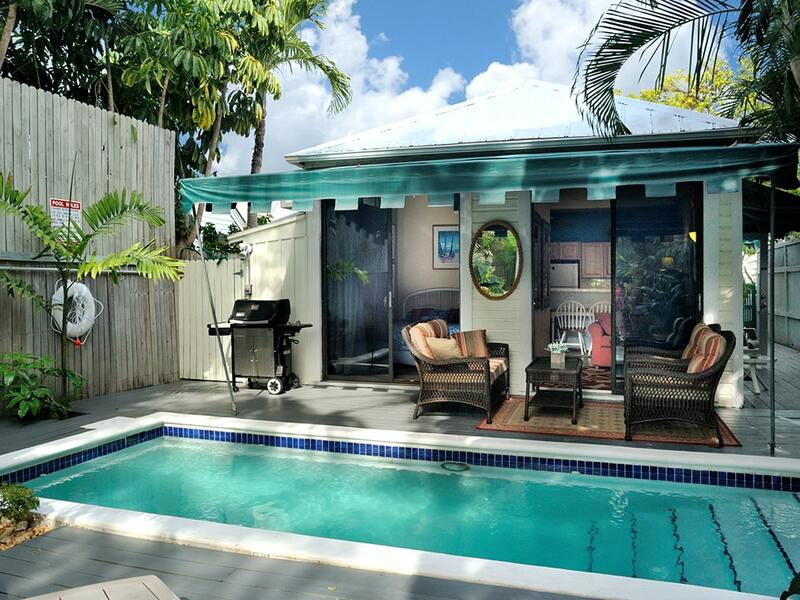 Always a pleasure staying with Vacation Homes of Key West. They are helpful and immediately responsive to any needs and requests.